A new, exciting breakthrough in the treatment of pain. 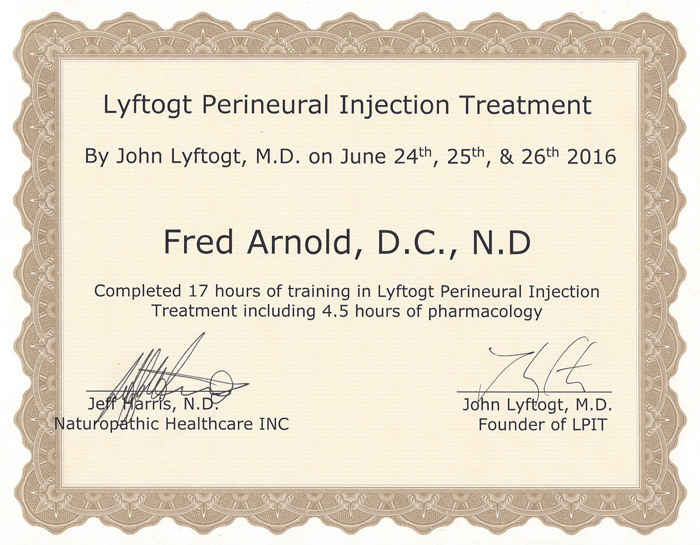 Perineural Injection Therapy combines the treatment principles of both neural therapy and prolotherapy. Following an injury or overuse of an area, there is increased production of sodium & calcium which causes the associated nerves to swell and become inflamed. The nerves then release protein messengers called neurotransmitters, which are the chemicals that allow electrical impulses to occur. The only problem is these neurotransmitters, called Substance P & CGRP (Calcitonin Gene Related Peptide), promotes neurogenic (nerve) pain and inflammation. Neurogenic pain is also referred to as neuropathic pain and is the type of pain that lingers after an accident and does not go away and is referred to as chronic pain. Neurogenic pain is a severe and debilitating pain that can render patients unable to walk, sleep or enjoy life. This nerve pain can be very intense and present in a number of ways including, burning, knife like, stabbing, hot, tight, deep/dull, tingling, creepy crawling, wet sensation, and electric. 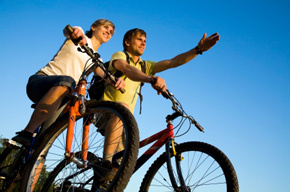 The pain can occur anywhere from head to toe, overlying a tendon, bone, or joint. The traditional approach for chronic pain is to prescribe pain killers and narcotic medications to help the patient deal with the pain. 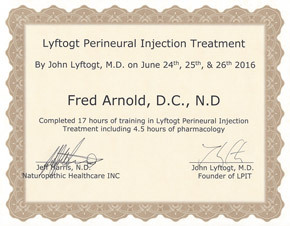 Perineural Injection Therapy involves multiple small injections along the path of tender superficial nerves in the area of the patients pain with a small amount of 5% Dextrose (basically sugar water). 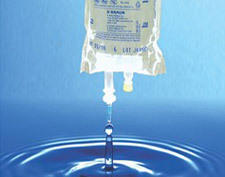 The dextrose solution works by immediately blocking the nerve endings (TRPV-1 or Capsacin receptors) that are responsible for the nerve pain and inflammation with the associated superficial nerves. This leads to healing beneath the nerve to deeper structures like the associated muscles, tendons, ligaments and cartilage of involved joints. Patients with nerve pain (neurogenic pain) can experience pain relief within seconds and are often shocked & look at me funny that their pain is gone without an anesthetic or cortisone shot. Immediately after the injection, there can be improved range of motion and use of the painful area. This ability to treat superficial nerves and heal beneath the surface of the nerve and heal the surface of the nerve is referred to as Hilton’s Law and has been a medical principal since 1863. What conditions may respond to Perineural Injection Therapy? Fibromyalgia, headaches, migraines, neck, shoulder, elbow, wrist, hand, low back, hip, knee & foot & ankle pain may respond to Perineural Injection Therapy. Generally, any condition that involve tendons, ligaments, cartilage and muscles of painful or arthritic joints are targeted. Dr. Arnold individually evaluates each patient thoroughly with a personal history and physical examination, including observation of the gait. Careful examination with palpation of involved area is made as it corresponds to the superficial nerves in that area when the patient is experiencing their pain. On an individual basis, further evaluation may include ultrasound evaluation, X-rays and/or MRI before receiving Perineural Injection Therapy. In cases involving chronic pain, Dr. Arnold will use his expertise to provide a comprehensive treatment approach that includes rehabilitative exercises, nutrition, and specific supplements to maximize your health and ability to heal. 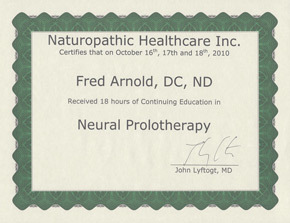 It is not possible to always predict the exact number of sessions required, since each patient’s condition is unique in terms of his or her ability to repair and heal an involved area. Most patients require 4-6 treatments for a mild-moderate condition with additional treatments for more severe conditions. Per area, patients receive an initial treatment in the office with anywhere from a few to 30 small injections of a small amount of sugar solution (1/2cc), with a tiny needle (like used for TB test). If the initial injections do not provide immediate profound relief, we move on to different procedures to treat the problem at a deeper level. The relief from the initial treatment lasts between 4 hours to a few days and will not be permanent. Repetitive treatments will be required for long term relief. Generally patients return each week with fewer regions to inject and 10-15% gradual improvement weekly. Typically, injections are done once weekly or every other week. Case #1: We recently treated a 62 year old male with chronic shoulder pain with moderate to severe degenerative joint disease. After the initial injections, the patient could tell immediate improvement in his pain and range of motion. He was surprised how well his shoulder felt and how high he could raise it without pain. The patient received 4 separate treatments 1-2 weeks apart with improvement after each treatment. Case #2: Another case involves an 88 year old male with hip pain. An orthopedic doctor told him there was nothing that could be done for his hip until it got worse. He had difficulty walking and rising from a seated to standing position. His hip frequently felt weak, like it might “give away”. 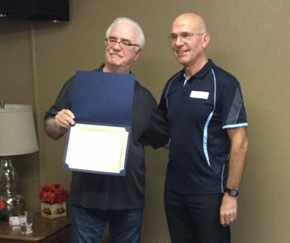 After his first treatment, he reported an immediate reduction in his pain with improved stability. He was surprised he felt immediately better and asked me if I was using a narcotic in the injection solution. 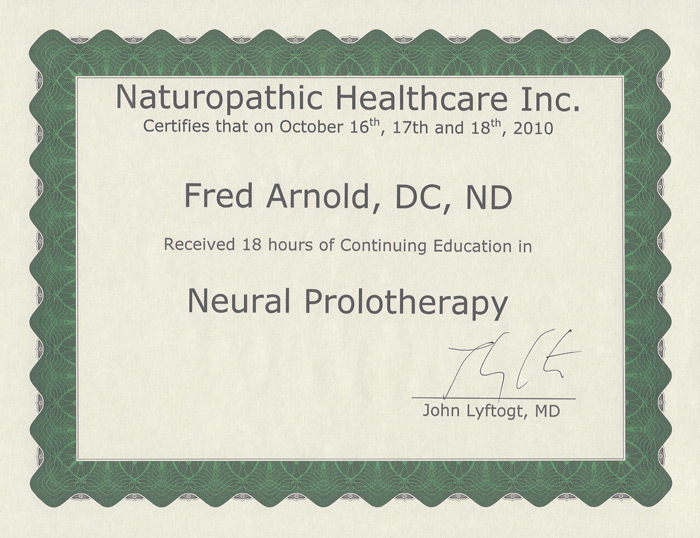 He has continued to improve 10-15% with each treatment session. The Prolo-PRP IV is a specialized intravenous mixture of vitamins, minerals and amino acids to maximize the effects of regenerative medicine injections such as Perineural Injection Therapy performed at Scottsdale Pain Rehabilitation and Wellness. This specialized IV promotes the healing and regeneration of damaged and weakened tissues such as ligament, tendon and cartilage. With intravenous nutrition, the nutrients are delivered directly into the blood stream rather than being absorbed by the intestines. The time to complete the Prolo-PRP IV is 2 hours. 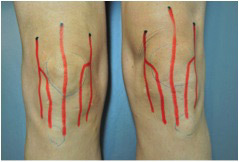 Perineural Injection Therapy treatment is a very effective treatment for chronic painful conditions. 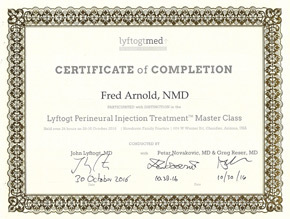 Of all the pain treatments, Perineural Injection Therapy is probably one of the safest injection therapies and easiest to administer with the least amount of discomfort to the patient since a very small diameter needle is used and the injections are very shallow, approximately ½ inch. Patients are able to normally see an immediate change in their pain with improvement in range of motion. 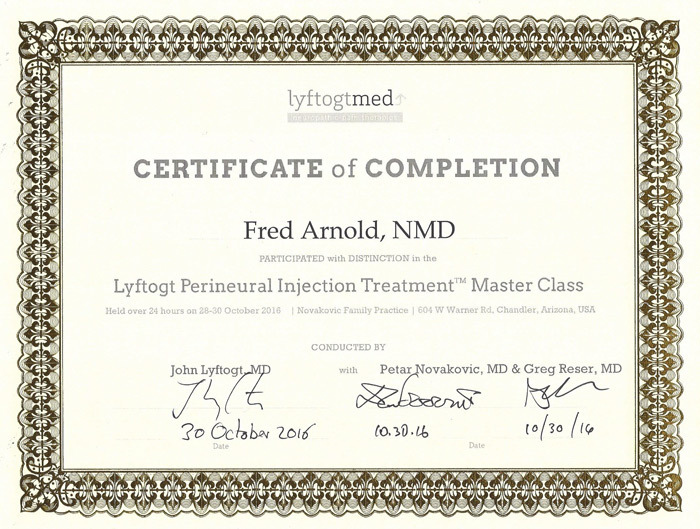 Perineural Injection Therapy is a treatment consideration when a patient’s chronic pain condition is not relieved by other treatments such as prolotherapy, prolozone, PRP and joint and back surgeries.